In the Oedon Chapel, you'll find the Oedon Chapel Dweller. This creature ask you to bring people to the safety of the chapel. The characters you can bring are: Arianna, Adella, Lonely Old Woman, Narrow-Minded Man, and a Suspicious Beggar. 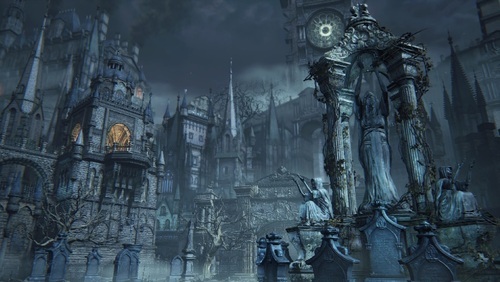 Alfred is also met for the first time in the Cathedral Ward, behind the tomb that leads to Old Yharnam. In the Grand Cathedral, Vicar Amelia guards the gate to the Forbidden Woods. To gain access, you must inspect the skull on the altar, which will change the phase of the moon to night. "The Byrgenwerth spider hides all manner of rituals, and keeps our lost master from us. A terrible shame. It makes my head shudder uncontrollably." "A watchman of Byrgenwerth guards the gate with a password, the sacred adage of the Grand Cathedral." "Heir to the ritual of blood, purveyor of ministration. Place your hand on the altar's sacred covering, and inscribe Master Laurence's adage upon your flesh." "The sky and the cosmos are one. - The Choir." The giants (at least the ones present in Cathedral Ward) are basically sentinels that answer to the highest level of authority present in the area, which happens to be Amelia. When you defeat her, and night falls, the Giants more than likely return to their passive states, as they are stripped of their purpose. It seems evident that the Church Servants and Giants are the handiwork of the Church's meddling, as they are anything but human. They may walk upright, but they're quite monstrous in appearance and stature. Some suspect that both were used as both assets on the Hunt and as enforcers. Or they could just simply be resting. Lugging around that much weight, especially up and down comparatively small steps, is probably a huge burden on them. Though, it is a little odd because the giants are the ones wearing the bells that signify the hunt's on. You'd think at nighttime they'd be patrolling when the hunt was at its peak. Some presumed that the door linked back to the end of the Great Bridge, where you fight the Cleric Beast. While that is true, the reason for it staying shut is simply that the mystery door did in fact open in a pre-release build of the game. So, it was cut either for lore reasons, as a way to troll players, or to prevent people from being really underwhelmed by what would ultimately have been a fairly useless shortcut. Yharnam's done fer, I tell ya. Tell 'em about this here Oedon Chapel. They'll be safe here. The incense wards off the beasts. They even let beggars like myself in! Shoes worn by Arianna, woman of the night in the Cathedral Ward. Innocent and cute, in contrast with its owner. blood is similar to precisely what was once forbidden. reveal the adage, touch the altar skull. Key to the gate that blocks the Tomb of Oedon. residents of Oedon have all gone mad. occupying the Upper Cathedral Ward. but might the cosmos be very near us, only just above our heads?